Calling Fred Flintstone: Mastodons in Cranford! Based on a favorable scouting report from Birding on the Net, Ivan and I struck out two Sundays ago to see who we'd find near the Deserted Village in Watchung Reservation. We'd gotten a somewhat late start after a long day in Atlantic County, so we weren't sure what, if anything we'd discover. An extensive hike brought us an immature red tailed hawk being hassled by blue jays, as well as orioles, a rose-breasted grosbeak, scarlet tanager and others, but the real find was along the park road on our way out. Driving Glenside Avenue back to Tracy Road, I saw a temporary lawn sign with the outline of what looked like a hairy elephant. The lettering read "Mastodon. Trailside Nature and Science Center." plus a tusk to the rear. A mastodon? This was a new one on me. The county had completely revamped the museum a few years ago to feature much of the local flora and fauna, but they hadn't added any prehistoric creatures. I couldn't remember seeing any fossils in the old museum, either, so this deserved a special visit. As Ivan noted, sometimes the most hidden history is buried beneath our feet. That was even truer than we realized. Turns out the mastodon in question was found in one of our stomping grounds, Lenape Park in Cranford. WPA workers were digging an artificial lake there in 1936 when they came upon a tusk and jaw from a young male mastodon. Geology professors from both Princeton and Rutgers came to the site to supervise the excavation of the relics, which they later theorized had been transported from elsewhere as the Wisconsin glacier receded. 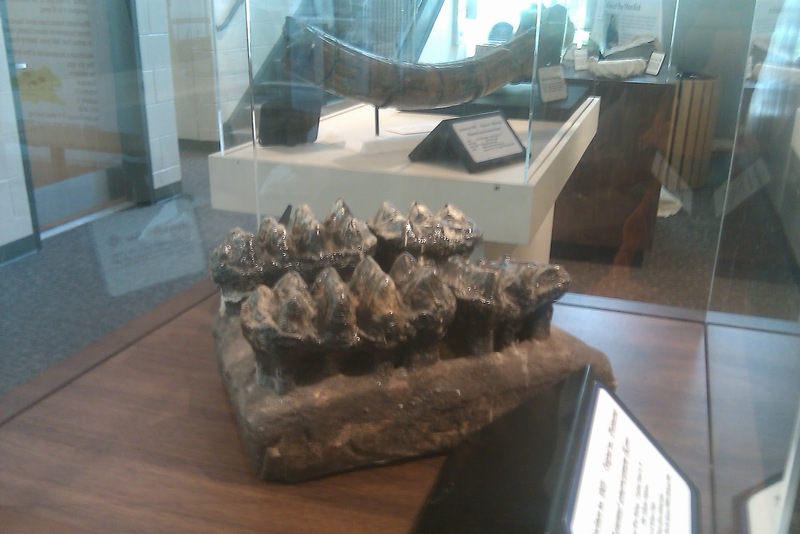 While the mastodon who gave us these relics may not have been a resident of what later became New Jersey, the species wasn't a stranger to the state. An 1844 discovery in Hackettstown revealed five full skeletons, and the results of a dig in Mannington in the late 1800s yielded nearly a full mastodon skeleton, now a centerpiece of the Rutgers Geology Museum in New Brunswick. A litany of other discoveries is scattered through much of the state. Here's the mysterious part of the Trailside exhibit: it mentions additional mastodon finds in Union and Westfield, but the accompanying website states that there's no surviving evidence or scholarly notes on artifacts or their whereabouts. Could it be that someone's hiding a mastodon head in their attic? Could it be a stepping stone in a garden, the way another skull was used in Pemberton before being identified for its paleontological value? Check your backyards and cellars and let us know! Killing time before meeting another couple for dinner, Ivan and I strolled down Palisades Avenue in Englewood recently, on the off chance we'd find something interesting, or maybe just a store to browse. A few blocks down, the World War monument at Lafayette Avenue caught his attention, while my eyes were drawn just past it. 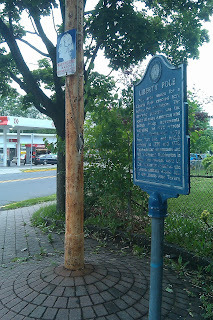 You guessed it -- I spied a blue New Jersey tercentennial marker, with a Bergen County historical plaque next to it. Not far from it was a distinctive 1776 Retreat Route sign. It was a trifecta I couldn't pass up, even if it meant dodging cars on two busy streets. We've all got our weaknesses, right? Ivan may want to spend hours waiting out a rare scissor-tailed flycatcher, but I'm loathe to pass up a good story. In my excitement, I'd barely noticed the reason for the signage: a beat-up pole with another marker featuring a profile of George Washington and captioned "Washington's March November 21-22, 1776." We already knew about the American retreat from our visit to New Bridge Landing, but it didn't explain why this precise spot was of any significance. The marker was a bit cryptic, but it told the basic story. A liberty pole was raised there to commemorate the repeal of the Stamp Act in 1766, plus the spot had seen its share of troop movements. Washington had led the Continental Army past the pole during the retreat from Fort Lee, followed by British troops that also returned two years later. The sign also said that Washington had used the area as his headquarters sometime in 1780, accompanied by Lt. Col. Alexander Hamilton and General Anthony Wayne. That's all fine and good, but what makes a flagpole a liberty pole? The answer is in the intent. Englewood's pole was just one of several put up in the American Colonies as a sign of independence after the Stamp Act was repealed in 1766. Legend has it that the pole was raised by the fiercely patriotic owner of a nearby tavern, and topped with a cap reminiscent of the one that the goddess Liberty is often portrayed as wearing. The act is reflected in the New Jersey state seal, where Liberty is holding a staff topped by a floppy cap. If you've ever looked at our flag and wondered why she's grasping a stick with a sock on the top while Prosperity gets to hold a cornucopia, there you go. During colonial times, the Sons of Liberty or disgruntled townspeople would raise a signal flag to the top of their community's liberty pole to announce that a meeting of those sympathetic to the cause would soon take place. That didn't go unnoticed or unanswered in areas heavily occupied by British troops. New York City's pole was replaced five times over the course of a decade, with patriots putting up a new one not long after the King's forces would take the predecessor down. It's not clear whether the Englewood pole annoyed the Brits sufficiently for them to tear it down, but it's been replaced several times in the past 246 years. The most recent incarnation, peeling paint and all, is a flagpole that was erected in 1964. Fresh from our find at Weymouth, Ivan and I headed a slight bit eastward on the Black Horse Pike. I'd heard about another ancient Pinelands factory nestled within an Atlantic County park. We were so close by, we had some time before we were expected elsewhere, why not go for it? The former Estellville glassworks operated from 1825 to 1877 and was reportedly among the first to produce both window glass and bottles. About three and a half miles south of Mays Landing proper, it's now surrounded by an expansive parkland of playgrounds, picnic areas and untouched woods. The factory site itself is about halfway along the circular park road, well marked out with wayside signs. Though the buildings have deteriorated to about the same level of falling-apartness as the site we'd just visited, helpful numbered maps direct visitors to various features of importance in glassmaking. Like the Weymouth Furnace, the glassworks was made up of several buildings, but in this case, each represented a stage of the manufacturing process. We first went to the pot house where workers made the vessels in which sand, potash and limestone would be mixed and melted to make glass. According to the wayside, replacement pots were needed often, as they'd become damaged by the high heat of the melting process. Several steps away, a three-room building once held the furnace where the raw glass was made. It was also where glassblowers would shape the molten material into cylinders that would be flattened in another building and eventually cut into windowpanes. Here's the wild thing: the blowers would often strap themselves to the wall as a counterbalance against the 80 pounds or so of molten glass they'd pick up from the vat with their blowpipes. Those who chose not to take the safety step might -- and sometimes did -- find themselves falling into the pit to meet an unfortunate and painful end. Between the furnace building and the flattening building, I noticed several small objects glistening in the sun. They turned out to be weathered pieces of glass, possibly from the factory itself, as none of it seemed thick enough to have been broken bottle shards from a more recent visitor. The park signs and online guide led me to believe that foundations of workers' houses could be found in the far reaches of the tract, so Ivan and I followed a path into the nearby woods. As we walked, I remembered something I'd read in the handy WPA Guide to New Jersey, which only mentioned the glass factory as a side note. The writers were more interested in highlighting Estellville as the birthplace of the Leeds Devil, more commonly known these days as the Jersey Devil. Before we go much further, I want to make a statement: we here at Hidden NJ try to avoid the usual Jersey legends and apocryphal stories in favor of the more obscure yet plausible. I'm rather proud that we've published for nearly a year and a half without making hay of Mother Leeds' thirteenth child, but when you stumble upon the purported birthplace of the ol' JD, you have to say something. Plus, he's got wings, so I figured I could include him as a birding feature. I mulled the possibilities as we walked farther down the path than my research had indicated the workers' homes would have been. The path was well maintained and lined in places by flowering bushes, but who knew if we were walking into territory where a cloven-hooved flying beast would rather be to himself? Focused on finding some of the birds whose songs he'd been hearing, Ivan ignored my suggestions that maybe I'd misread the map and we should instead be looking for the buildings elsewhere. We decided to turn around after we reached a small deck overlooking a creek and pilings that once apparently supported a bridge. Walking back to the glassworks, we did find an elusive flying creature, but it turned out to be a yellow billed cuckoo rather than ol' JD. Given the park's size and diversity of habitat, we'll likely be headed back to Estellville sometime soon for birding at a more productive time of day. I guess that means we'll also have another chance to check in on the state's scariest and most active citizen, the immortal Mr. Leeds. Of all the times we've visited Forsythe NWR, Ivan and I had yet to venture west of Route 9 in Atlantic County. This past weekend we headed inland on the Black Horse Pike to check out a couple of old factories we'd heard about. These weren't factories in the 20th or 21st century tradition ... they were OLD, befitting the development (or lack thereof) of the Pinelands. What many people don't realize is that while there's very little industry there now, the area was a hotbed of production in the early days of the United States. There's iron in that water! Our travels took us less than a mile off the Black Horse, on County Road 559 to a smallish park along the Great Egg Harbor River. Well populated on a flawless May afternoon, the site has plenty of older trees to shade the grassy areas, along with the ruins of several old brick structures. A gentle though brisk current brought a few parties of canoers through, but something else about the river caught my attention. While the water was as clear as you'd expect in the Pinelands, the sunlight exposed redness on the river bed. That rust color explains just why the old brick structures are at Weymouth: the presence of iron. We've talked a lot about the iron mines of the northern reaches of the state, but very little about the south, where bog iron once drove significant industry in the Pinelands. A partnership of five men got state permission in 1801 to dam the Great Egg Harbor River as a power source for an iron works at Weymouth, and within 50 years, the site was host to one of the region's largest communities. Besides a charcoal-fired furnace and forge, industry on the 85,000 acre site included a gristmill, sawmill, blacksmith and wheelwright. A store and Methodist church were also built, along with housing for workers and a large mansion for the forge's owner. For most of its operating history, the iron forge produced mundane items like nails, pipes, stoves and cooking pots, but it contributed to the nation's defense, too. Weymouth supplied shot and bombs to the army for the War of 1812, though it seems not to have done the same during the Civil War. With the development of the coal industry, Pennsylvania forges could produce better quality iron products, essentially leaving New Jersey in the dust. Iron processing may have ceased to be an option at that point, but the river continued to power industry at the site. The Atlantic Paper Mill and Weymouth Paper Mill recycled rags, bagging and manila rope to produce paper until wood pulp became more prevalent as the main ingredient for paper products. By 1898, the mills were silent, rendered obsolete by progress. The property lay unused, buildings decaying and vandalized, until 1966, when the Atlantic County government started buying up the property for inclusion in the park system. Some of the ruins have been fenced in for protection, but you can still reach some of the stabler structures, including the arches that span the largely dry millraces. A cast-brick chimney also stands in stark contrast to the stone foundations of the furnace it once served. Given the impulses that unfortunately drive some people to destroy history, I have to say it makes sense to surround the Weymouth ruins with a park. Visitors are exposed to a fascinating aspect of South Jersey history as they picnic and canoe through the property, and hopefully that encourages them to learn more. Having people around also tends to deter vandals from acting out. One resident in particular seemed to be taking extra effort to guard the fenced-in ruins while we were there. Ivan noticed a female Louisiana waterthrush sitting on a branch just above the enclosure, wagging her tail from side to side as if conducting an orchestra. She patiently waited for us to leave, no doubt because she wanted to distract us from her nest. Regardless, it was a nice little surprise, considering we didn't expect much avian activity during the middle of the day. This one isn't particularly hidden, if you consider it's the origin of a name of a fairly well-known town in Bergen County, but then a lot of people have no idea how a given town got its name. I saw it for the first time when Ivan and I were heading home from an afternoon party. It was dusk, the streetlights were just about to come on, and we were driving down Rock Road in Glen Rock. As we passed the train station and approached Doremus Avenue, I saw it: a big rock in the middle of the intersection. Well, sort of. It's just off of Rock Road, and Doremus Avenue kind of forks around it, so it doesn't impede the smooth flow of traffic or create a default traffic circle. It's just a very unusual thing to be plopped down in the middle of a largely residential neighborhood. Or maybe the way to look at it is that it's an unusual thing for a largely residential neighborhood to plop itself around. Indeed, the rock has been a gathering place for a long time. The native Lenape reportedly called the 570-ton boulder Pammackapuka or "rock from heaven" and gathered there for tribal meetings. Upon arriving in the region, early European settlers used the rock as a boundary marker when surveying property. It's believed that the rock was originally transported there by a glacier. In any case, the Glen Rock rock isn't going anywhere. It seems to be well respected, with a plaque on it to honor war dead. And while it has no protective barriers around it, it seems unscathed by errant traffic. Perhaps the Lenape were right about its source, and some celestial good karma protects it. It's safe to say that if you choose to visit it, the rock will look pretty much the same way it did when Ivan and I stopped by. Just before you get to Fort Hancock on Sandy Hook, you might see a smallish stone wall with a replica ship's mast just behind it. Topped by an American flag, the mast also holds the British Union Jack and the Red Ensign flown by the Royal Navy. Why is the flag of the United Kingdom being flown at what used to be a United States Army base? The nearby Sandy Hook Lighthouse was commandeered by British troops during the American Revolution, but that doesn't have much to do with the story. 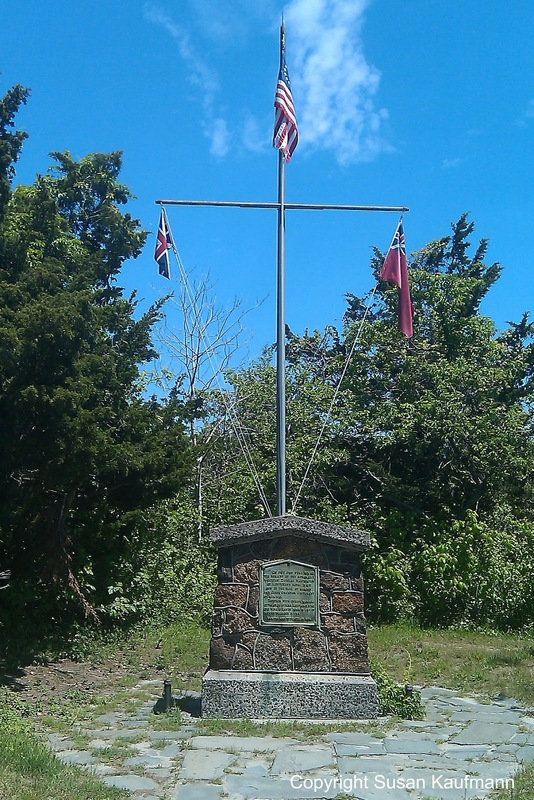 Instead, this unusually-placed pole and monument memorializes the deaths of several crew of the HMS Assistance at Sandy Hook more than a year after the British Parliament voted to end the war and armed hostilities had pretty much come to an end. Their deaths came not as the result of enemy fire or rough seas, but from the weather and possibly poor planning. The Assistance had been one of many British vessels stationed in and around New York Harbor, and in late December 1783 she was anchored in Sandy Hook Bay in preparation for the Navy's departure from the newly-victorious United States. Capitalizing on the proximity to land, several of the ship's crew decided to desert. When their absence was discovered, the ship's captain ordered a recovery team to search Sandy Hook for the errant sailors. Led by Lieutenant Hamilton Douglas Halyburton, 12 crew members made their way to the Hook to begin their search on December 31. It's not clear whether they found any of the deserters; what is known is that Halyburton's group became trapped by a snowstorm, and all died of exposure. 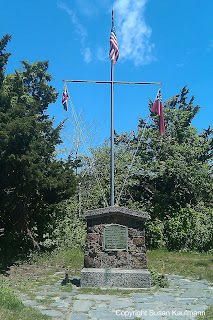 According to the Park Service wayside marker near the memorial, the remains of the unfortunate party lay at the site of the memorial untouched until 1909 when workmen at Fort Hancock discovered them. They were moved to Cypress Hills National Cemetery in Brooklyn, which also holds the graves of Civil War Soldiers (both sides) and a memorial to the War of 1812. While the men of the Assistance are no longer present on Sandy Hook, the Depression-era Civilian Conservation Corps built a monument in their memory. The stone marker, made from local puddingstone, includes a plaque that tells the story of Halyburton and his search party, leaving out the part about the deserters. You have to wonder: did the searchers find any of the deserters? If not, did any of the deserters survive? Could there still be remains of unhappy, frostbitten former British soldiers in the salt marshes of Sandy Hook? Usually I'm pretty single-minded when I'm traveling to or from Sandy Hook: it's a non-stop trip from home to the Hook, or vice versa, interrupted only by a stop for gas or maybe a custard cone. Yesterday, however, Ivan had other ideas as we made our way home after a productive birding excursion. "Let's stop on the bay," he said. "There's some good shorebird habitat there, and maybe we'll run into something else." "Something else" is usually a historic spot or a notable sign or something. This time it wasn't. Once we parked the car near a newish townhouse development, Ivan led the way along a sandy dirt path until we reached the waterline. On one side was the bay, with a nice tract of spartina being flooded by the incoming tide. On the other was the mouth of a small creek, edged by a dirt/sand mixture of shoreline. I was a bit birded out for the day, so I focused on what was moving around in the water. There was plenty to watch! One mistake I made on the narration: horseshoe crabs aren't as plentiful as we need or would like due to overharvesting. They're actually quite popular for use as bait in the eel and conch fishing industries, plus their blood has certain benefits for use in medicines for humans. While they can be effectively bled and then returned to their customary habitat, the bleeding process has a horseshoe crab mortality rate of 10 to 15 percent. Raritan Bay shorebirds will likely enjoy some of the eggs we saw being laid, but the acute need for horseshoe crab spawn is on the shores of Delaware Bay. Hundreds of thousands of migrant birds, including the threatened red knot, customarily land on the beaches looking for their first meal after a long journey. Without horseshoe crab eggs to count on, it's likely that many of them would die of starvation. Thus, organizations like New Jersey Audubon have been sounding the call for conservation and protection of these prehistoric animals. They may not look especially attractive, but they're a crucial link in our ecosystem. If you happen to be on the beach around high tide, keep an eye out for these ancient helmet-shaped creatures. You'll get a biology lesson you won't soon forget. I know I won't. New York's Metropolitan Museum of Art contains one of the world's finest and most diverse collections, thanks in large part to a cranky, uncharitable Paterson industrialist. By most accounts, the guy didn't even care that much about art. If you visit the Met and read the small placards next to the works on display, chances are you'll frequently see the words "Rogers Fund" as the funding source. That's referring to Jacob Rogers, the aforementioned curmudgeon. The son of Rogers Locomotive Works' founder Thomas Rogers, he became the manufacturing concern's president upon his father's death in 1856. The company was the largest of five locomotive manufacturers in Paterson, turning out a new railroad engine every two days. While Jacob Rogers was among the wealthiest men in the city, there's no trace of his generosity anywhere in Paterson. In fact, he seemed to enjoy turning down requests for donations and small favors. Young boys who asked if they could use a portion of his land for a ballfield were told he'd lease them the land for $2000 per month -- after they erected a $5000 fence around it. Even when he chose to give funds to a worthy cause, the donations could end at any time. A representative from a local hospital suggested that Rogers might be able to afford a monthly gift of more than the $100 he had been sending; the stipend was quickly and permanently stopped. Much of this behavior stemmed from restrictions the Paterson city government had put on Rogers' business, primarily forbidding the company from starting any of its locomotives within the city. Undoubtedly this meant having to use protracted and expensive means of moving product out of the factory to customers. Rather than seeking a mutually satisfying compromise, Rogers instead held a grudge against the city to his dying day. That's a good explanation for why there are no grand tributes to Rogers' largess in Paterson, but how does he become one of the Met's most influential donors? It seems that his contrariness is a major factor. He'd read about a wealthy man who'd died in the Midwest in the 1880s, leaving his entire estate to a group of educational institutions. The man's family contested the will, but it held up in court. Rogers, a lifelong bachelor, didn't believe in inheritance and saw an opportunity in the Midwestern man's approach. He became a member of the Met, delivering his $10 membership fee to the museum director each year. He asked about the institution's management structure and finances, and though he mentioned he'd be addressing the Met in his will, the director didn't think much of it. It seems that the only times Rogers visited the museum were to deliver his annual dues -- not exactly the type of member one would expect more than a couple thousand dollars from after death. Apparently the Met management was unaware he was a wealthy locomotive magnate. They just thought he was an unusual man who was curious about where his membership money was going. Rogers' seeming obscurity at the museum ended with his death in 1901. Other than small inheritances to a few of his nephews, he left the entirety of his estate -- liquidated property and all -- to the Met. The $5 million was the first gift over $1 million the struggling museum had ever received. Rogers stipulated that his bequest was to be invested and the principal left untouched; the museum was allowed to spend only the income. Unlike other donors, however, he set no boundaries on the types of art the institution could purchase with the proceeds of his gift. As the museum's then director Luigi Palma di Cesnola said of New York millionaires at the time, "They will give money for buying collections, and for building purposes, because both remain visible monuments of their generosity, while endowment funds are invisible and remain unknown to the general public." Since then, the income from Rogers' gift has funded the museum's productive archaeological expeditions in Egypt as well as the acquisition of legendary works by Rembrandt, Velasquez and other acclaimed artists. The principal continues to grow and earn, ensuring that a Patersonian known in life as tightfisted and mean will, nonetheless, endure as an example of generosity. Just a small part of the existing Helme Products mill. Given that snuff is a form of pulverized tobacco, one would wonder why it would be manufactured in New Jersey rather than below the Mason-Dixon line. The Helme factory was once the world's largest snuff plant, primarily shipping its products to southern states. This dichotomy mirrors the life of the founder of the company (and the town), George Helme. Though born in Pennsylvania, he practiced law in Louisiana and was an officer in the Confederate Army during the Civil War. His wife's family lived and operated a small snuff mill in Spotswood, and George soon became a partner and then sole owner of the company, incorporating it under his own name in 1884. Expansion of the business also called for expansion of the community. In classic company town fashion, Helme bought additional land to build more factories along with worker housing, government services, and the like. He named the town Helmetta after his daughter, Etta. At a point, 500 people were employed at the mill, likely making for a lively, close-knit community of families. According to the WPA Guide to New Jersey, the snuff business continued to be profitable even through the Great Depression while providing solid jobs to 375 people. Today, Helmetta is much quieter. Many of the homes that mill workers and management lived in are still there, though updated and individualized to the point that they don't look much like company town housing anymore. The mill stands empty and silent, having been shut down in 1993 by a successor company that moved the New Jersey operations to West Virginia. Though the mill district was been placed on the US and state registers of historic places in 1980, several of the structures have been demolished since. As I've researched the town, I've discovered that plans have been put into place to demolish the plant buildings and erect townhouses, multi-family housing (apartments?) and a community center. The borough council put several stipulations into place, apparently to ensure that the demolition and construction would be completed as quickly as possible after a suitable developer was chosen. Some of the area appears to have been cleared, and the pond I visited was clearly remediated, but otherwise, there's no sign the mill will be coming down anytime soon. Okay ... confession time here: Ivan and I actually left New Jersey for a week. With tax season completed, he needed a break and who was I to deny that? And as he rationalized, we're always on the lookout for a little bit of New Jersey wherever we go. You never know what we'll find. The good thing is that now we'll have more time for exploration, birding and letting you in on what we discover. In the meantime, I thought you might enjoy a little story from about 20 years ago that combines exploration and birding of a sort. Not the chicken that crossed the road in Union. I've mentioned that I grew up in Union, which, like many New Jersey communities, was once host to many farms. By the time I was born, though, most were gone, with perhaps small farm stores left in their places. One was still in operation on Stuyvesant Avenue in the late 1980s, right across from my bank, selling shrubbery, plants, gardening supplies and perhaps some produce. 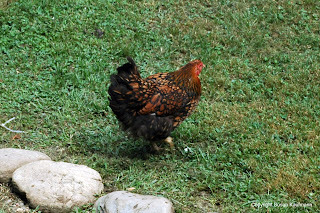 A cranky old rooster walked the grounds, unimpeded, despite the fact there hadn't been an actual farm there for many, many years. One day I was driving to the bank when I saw the rooster standing on the yellow line in the center of Stuyvesant Avenue, frantically looking back and forth, perplexed. Not a sight you see very often in Union. Aloud, I asked myself, "Why is that chicken crossing the road?" I started laughing so hard that I had to pull to the side of the road. Fortunately, I came nowhere near the bird. This story is entirely true. I swear. I even sent it to the New York Times for publication in its old New Jersey Diary section of reader recollections. A few weeks later, they published it, along with an editor's note: "Why did the chicken cross the road? To open a chicking account." Often, when we hit the road, birding's the top priority, with the hopes of finding something obscure or historic along the way. This time of year, the trips start at the crack of dawn so we can be in the appropriate spot by the time the birds wake up for the morning. The primary equipment is binoculars, and many times the only camera on board is the one in my cell phone. Other times, I make targeted journeys to places I've heard of and want to investigate, camera and notebook in hand. If I find some interesting habitat along the way, I'll make note and maybe stop for a few minutes to check it out for a future return trip with Ivan. I keep a spare set of cheap bins and a Sibley guide in the car in case something compelling shows up, but they often go unused. Last week I made the latter type of jaunt to the small hamlet of Helmetta, formerly a company town for a snuff mill. After taking a few photos of the shuttered factory, my camera quit on me, so I thought, "that's snuff," and decided to check out what's behind the big building. The story of the factory is for a future post; for now I'll say it's been closed for about 20 years and some of the surrounding property appears to be in a stage of remediation. From Main Street, I crossed the railroad tracks in front of the factory and headed down the road between two of the buildings that make up the plant complex. Helmetta Pond is to the left, fronted on the street by a small playground and parking area. New benches, relatively fresh concrete and cinder walkways and a wooden plank observation deck led me to believe that this body of water is being brought back to health after possibly having served as a dumping area for the plant's liquid waste. The opposite side of the pond is fronted by woods and looks a lot less disturbed by the hand of humans. I noticed a solitary birder with bins raised to eyes, so I figured it was worth taking out the spare optics, rudimentary as they are. I didn't hear anything distinctive, just the usual goose honks and red-winged blackbird calls. Swallows skimmed along the pond's surface, looking for insects, and I figured that might be as exotic as my finds would be on this trip. Still, though, you never know. Somehow I sensed the other birder knew what he was doing, and he was hanging around, so I decided to invest a few more minutes in looking. Walking along the cinder path, I kept an eye out for movement and an ear out for something, anything but the birds I'd already ID'd. Perhaps there was something on the far end of the pond, maybe a heron or an interesting duck? Things didn't look very promising, but then I saw something large flying the length of the pond, from left to right, about 20 feet above the water's surface. It was too dark to be a red-tailed hawk or an osprey, and its white head and tail meant it wasn't a turkey vulture. Could it be? I watched as it flapped its wings to soar higher and farther away from me. "Come on, come back," I said under my breath, quickly inventorying as many of the bird's attributes as I could while trying not to influence my own judgement by hoping it was what I thought it could be. (Just about any beginning birder can wish a house sparrow into becoming a rarity.) Despite my whispered entreaties, the bird continued to the farthest end of the pond and did a few circles before coming to rest in one of the leafed-out trees. What other bird is that big and has a white head and a white tail? This fella obviously wasn't going to give me another look, so I did the next best thing and called Ivan for an opinion. "The only other possibility is black-backed gull," he told me, but no way could a gull be as big as the bird in question. Yup, I'd just identified a mature bald eagle on my own, for the very first time. I've already seen a handful with Ivan, and belatedly identified an immature one I scared off on my March solo trip to Brigantine, but this one was special. I hadn't been expecting to bird that day, and nothing about the place had indicated I'd find anything but the usual suspects there. And, well, there's something eminently satisfying about making such a great discovery in a place that's not exactly a well-known birding hotspot. The other birder was still around, so I asked if he'd seen the eagle. He hadn't but said it was likely what I saw; there's a nesting pair not far away in Old Bridge. He also told me he'd seen a much wider array of birds in the park than I had, making it a nice little spot to check out in the future. Score one for the novice!